The perpetuation of healthy vision is paramount in an individual. It has been observed that various drug delivery systems have been fabricated to develop vision quality in individuals. Systemic ocular drug therapies have limited efficacy due to poor bioavailability, systemic and toxic side effects and low patient compliance. Various drug systems which follow the ocular route of administration are manufactured to achieve optimized bioavailability along with better patient compliance. Ocular implant is one such example. It is divided into biodegradable and non-biodegradable drug delivery systems wherein the former is more beneficial. This review aims to demonstrate the current momentum in the formulation and optimization of various biodegradable ocular drug delivery systems and its characteristics. Keywords: Biodegradable polymers, biodegradable implants, advancements, pharmaceutical technology, ocular implants, bioavailability. Keywords:Biodegradable polymers, biodegradable implants, advancements, pharmaceutical technology, ocular implants, bioavailability. Abstract:The perpetuation of healthy vision is paramount in an individual. It has been observed that various drug delivery systems have been fabricated to develop vision quality in individuals. Systemic ocular drug therapies have limited efficacy due to poor bioavailability, systemic and toxic side effects and low patient compliance. Various drug systems which follow the ocular route of administration are manufactured to achieve optimized bioavailability along with better patient compliance. Ocular implant is one such example. It is divided into biodegradable and non-biodegradable drug delivery systems wherein the former is more beneficial. 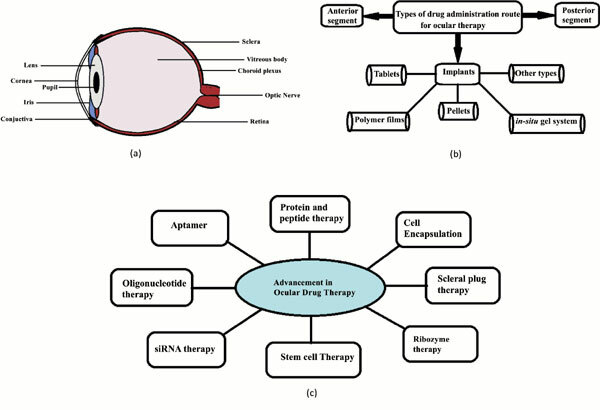 This review aims to demonstrate the current momentum in the formulation and optimization of various biodegradable ocular drug delivery systems and its characteristics.